Each piece in the set has something special. For example the Cocktail Jigger has measuring lines at 6 levels and a pour spout so one does not make a mess, which is something I tend to do pretty well sometimes. 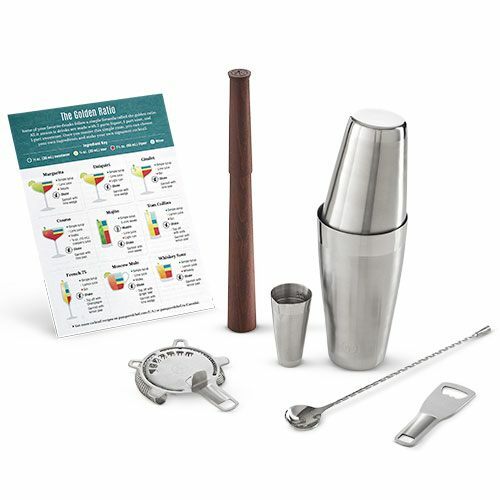 The Cocktail Shaker works for making individual or batch cocktails and the shakes allow you to feel when your cocktail is the right temperature. They also do not leak while shaking, which for those of us who tend to make a mess is a great feature. How often do we go through situations where our faith or our lives in general seem to be shaken up and because things leak out, we wind up dealing with a bigger mess than we had to. Not making a mess, seemed to be what so many parts of this set helped the user do. Whether it was the Jigger or Shaker or the Hawthorn style Cocktail Strainer, the items in the set allow you to make the perfect cocktail or mocktail without making a mess. What strains your life, keeping what you say and do to not make a mess you later need to clean up.